LaGoy-Weltz and Lonoir. Photo Credit: ©SusanJStickle. Wellington, FL — March 16, 2018 — Olivia LaGoy-Weltz (USA) and Lonoir chalked up their fifth win from six starts at the 2018 Adequan® Global Dressage Festival (AGDF) by taking the Grand Prix Freestyle CDI4*, presented by Havensafe Farm. Their resounding score of 76.6% in week 10 of AGDF at Palm Beach International Equestrian Center (PBIEC) in Wellington, Florida was a personal best for the pair, whose previous high freestyle score was 74.425%, achieved in Aachen in July 2017. Wellington, FL — March 15, 2018 — In both CDI4* grand prix classes of the day, it was the last horse who took home the winning sash and rug. Olivia LaGoy-Weltz (USA) was the beneficiary in the Grand Prix CDI4*, presented by Havensafe Farm, putting an unassailable 73.783% on the score board. 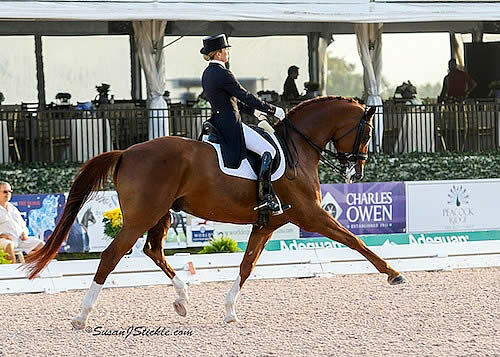 It was the showcase class on the second day of week 10 of the 2018 Adequan® Global Dressage Festival (AGDF) at Palm Beach International Equestrian Center (PBIEC) in Wellington, Florida. LaGoy-Weltz and her own Lonoir, a 14-year-old Danish warmblood gelding by Le Noir, have won four of their last five CDI starts — interrupted only by Adrienne Lyle (USA) on Salvino. “We managed to get everything in that test,” said LaGoy-Weltz, a Virginia native, referring to mistakes made in previous tests this season. “It seems like it’s been a case of if we get one thing, then something else goes away. There’s still stuff that can be better; he can pirouette for an eight in training, for example, but in there he was anticipating them and making them a hair too small. But I was super happy with his rideability and relaxation today. From last draw of 11 starters in the Grand Prix CDI4*, presented by Mission Control, Canada’s Brittany Fraser’s 71.957% — a personal best in the grand prix test for her and the 13-year-old All In — was enough to grab victory by 0.1% from Shelly Francis (USA) and Danilo, who had led the class from the outset. Fraser’s trainer Ashley Holzer — a four-time Canadian Olympian who now rides for the United States — finished third on Havanna 145 (70.783%). Olivia LaGoy-Weltz and Lonoir. Photo Credit: ©SusanJStickle. Wellington, FL — February 24, 2018 — Olivia LaGoy-Weltz (USA) put clear water between herself and her fellow competitors when winning the Grand Prix Special CDI3*, presented by Chesapeake Dressage Institute, in week seven of the 2018 Adequan® Global Dressage Festival (AGDF) at Palm Beach International Equestrian Center (PBIEC) in Wellington, Florida. Riding her own Lonoir, a 14-year-old Danish warmblood gelding by De Noir, she notched up 73.319%. The closest chaser was fellow American Arlene ‘Tuny’ Page, who rode Woodstock to 70.298% despite the discomfort of a fractured heel. The Dominican Republic’s Yvonne Losos de Muñiz filled third on Aquamarijn, a 13-year-old mare by United. LaGoy-Weltz found Lonoir when he was a seven-year-old at Danish Olympian Andreas Helgstrand’s barn in Denmark when predominantly looking for sales horses with her former boss, Kathy Priest. LaGoy-Weltz hopes to make it onto the list of eight American riders who will be invited to Europe for the summer to campaign for a place on the FEI World Equestrian Games team. Her next show with Lonoir will be the CDI4*, taking place at PBIEC on March 15-18. Aachen, Germany – All four horses on The Dutta Corp. U.S. Dressage Team, as well as two additional U.S. athlete-and-horse combinations competing in the Aachen CDI4*, have passed the horse inspection and are ready to compete at the 2017 World Equestrian Festival CHIO Aachen, in Aachen, Germany, July 19-23. The U.S. team, led by Chef d’Equipe Robert Dover, includes the 2016 Olympic combinations of Laura Graves and Verdades and Kasey Perry-Glass and Goerklintgaards Dublet, in addition to the exciting combinations of Olympic veteran Adrienne Lyle with Salvino and Olivia LaGoy-Weltz with Lonoir. Featuring a combination of new talent and international experience, the U.S. team will vie for top honors in Aachen while gaining experience and building momentum towards the 2018 FEI World Equestrian Games in Tryon, N.C.
Lyle (Ketchum, Idaho), a 2012 London Olympian, rides Salvino Partners, LLC’s Salvino, a 2007 Hanoverian stallion. She and Salvino continue to progress in their partnership. The exciting, developing combination recently placed third in the Grand Prix CDI3* in Rotterdam last month. Perry-Glass (Wellington, Fla.) will compete with Diane Perry’s Goerklintgaards Dublet, a 2003 Warmblood gelding. Perry-Glass and Goerklintgaards Dublet earned a team bronze medal at the 2016 Olympic Games and placed seventh in the 2017 FEI World Cup Finals in Omaha. In May, they won the USEF Grand Prix Dressage National Championship and was part of the gold medal winning team at CDIO5* Rotterdam in June. LaGoy-Weltz (Haymarket, Va.) will compete her own and Mary Anne McPhail’s Lonoir, a 2004 Danish Warmblood gelding. LaGoy-Weltz and Lonoir continue to grow their partnership after exhibiting strong performances including a team gold in CDIO5* Rotterdam and first-place finishes in both the Grand Prix and Grand Prix Special in CDIO3* Wellington, Fla. earlier this year. Graves (Geneva, Fla.) will ride her own and Curt Maes’ Verdades, a 2002 Dutch Warmblood gelding. Graves and her 2016 Olympic team bronze medal mount, Verdades placed second at the FEI World Cup ™ Dressage Final in Omaha. Most recently, they were part of the gold medal winning team at FEI Nations Cup ™ CDIO5* Rotterdam. Shelly Francis (Loxahatchee, Fla.) with Patricia Stempel’s Danilo, a 2004 Hanoverian gelding. Kathleen Raine (Murrieta, Calif.) with her own, Jennifer Mason, and David Wightman’s Breanna, a 2000 Hanoverian mare. Further information on the 2017 World Equestrian Festival CHIO Aachen, including a schedule of events and results, is available at chioaachen.de. Rotterdam, The Netherlands (June 30, 2017) — Custom Saddlery, crafter of tailor-made saddles for riders and horses of all levels, congratulates three elite competitors who had outstanding performances and top placings at the 2017 FEI Nations Cup CDIO 5* dressage competition in Rotterdam, South Holland. Each of Custom Saddlery’s “Most Valuable Riders (MVRs),” Olivia LaGoy-Weltz, Juan Matute Guimon, and Madeleine Witte-Vrees, demonstrated how important a personalized saddle is to each horse’s performance. Custom Saddlery MVR LaGoy-Weltz and her 17.1-hand, 13-year-old Danish Warmblood gelding, Rassing’s Lonoir (De Noir x Loran) competed for the United States team that won the Nations Cup Competition at Rotterdam with a final score of 446.442. LaGoy-Weltz is sure to keep Custom Saddlery a part of her winning strategy. “Custom has an extensive network of saddlers all over the country,” she says, “and now in Europe, too. So I have a great saddle support system no matter where I go.” This MVR will waste no time in putting this support system to use this summer. “We’re on to Aachen!” she said. Dutch Custom Saddlery MVR and Olympian Madeleine Witte-Vrees claimed reserve title in the Nations Cup Grand Prix with 75.660 percent, riding Cennin, a 10-year-old KWPN/Oldenburg stallion by Vivaldi. No strangers to success down the centerline, Witte-Vrees and Cennin were the Dutch reserve combination at the 2016 Olympics in Rio, and they currently stand 22nd on the FEI World Individual Dressage Rankings. Also successful at Rotterdam was Custom Saddlery MVR Juan Matute Guimon, a 19-year-old dressage prodigy who rides for Spain. His father is three-time Spanish Olympian Juan Matute, and the family lives in Florida. At Rotterdam, the young Matute won the CDI Under 25 Musical Freestyle on 14-year-old Hanoverian gelding Don Diego Ymas with a score of 76.015 percent – a personal best. The pair also took reserve in the CDI Under 25 Intermediaire II. Before entering an arena for what has become a must-watch ride, Matute Guimon saddles up with the Custom Saddlery’s Advantage R model. “I love the Custom Saddlery saddles,” the young man said. “I ride with the Advantage R because it’s comfortable and precise. It fits perfectly to my horses’ backs and I feel as if my seat aid is uninterrupted. Nice leather, great seat, and comfortable for the rider and the horse. Custom has a huge variety of trees so they really make the saddle customized. “Don Diego Ymas and I entered the arena with the attitude of a champion. We knew that if we wanted to win we had to give it our absolute best. We had a totally mistake free test and there was lots of harmony and power!” said Matute Guimon. The young Spaniard is looking forward to saddling up next at CHIO Aachen with an eye trained on competing at the 2020 Tokyo Olympics. Custom Saddlery MVRs know that quality tack and equipment are integral to bringing out the best in their horses. Other top dressage riders who agree include MVRs Heather Blitz, Patrik Kittel, and Steffen Peters. Custom Saddlery offers professional saddle fitting services with expert saddle fitters across the United States and internationally, and manufactures high quality accessories including stirrup leathers, girths, and saddle pads. Find a catalog of Custom saddles and an expert saddle fitter near you at www.mysaddle.com or call 1-800-235-3865. Olivia LaGoy-Weltz and Lonoir. Photo: ©SusanJStickle. 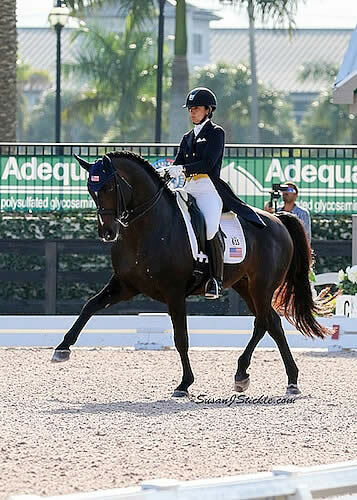 Wellington, FL – March 3, 2017 – Olivia LaGoy-Weltz (USA) and Lonoir climbed to the top of the leaderboard in Friday’s FEI Grand Prix Special CDI-W, presented by Peacock Ridge, at the 2017 Adequan® Global Dressage Festival (AGDF). It was a successful day for LaGoy-Weltz and her own Lonoir, a 2004 Danish Warmblood gelding (De Noir x Lorani x Loran), as they captured the title in the FEI Grand Prix Special, presented by Peacock Ridge, with a score of 71.608%. The pair has had a successful week after Friday’s win and Thursday’s second place finish in the FEI Grand Prix CDI-W.
Of her ride, LaGoy-Weltz said, “He was definitely very hot in the warm-up today. He came out really cool, but then we got under the big American Flag flying and it cracked a few times, and after that we were off to the races. I was really pleased with how he settled, because he did get lit up right before we went in but he got his focus back once we were in the ring. Arlene Page (USA) and Woodstock, a 2003 KWPN gelding (Havel x Mirania x Contango) owned by Page, were awarded second place in the FEI Grand Prix Special with a score of 70.922%. Third place went to Shelly Francis (USA) and Danilo, a 2004 Hanoverian gelding (De Niro x Annabella x Andiamo) owned by Patricia Stempel, with a 68.980%. Olivia LaGoy-Weltz and Rassing’s Lonoir. Photo © SusanJStickle.com. Wellington, FL – March 29, 2014 – American Olivia LaGoy-Weltz picked up her third first place prize in the FEI Intermediaire-1 presented by Wellington Equestrian Realty during the CDI 5*/3* at the Adequan Global Dressage Festival (AGDF) 12, hosted at The Stadium at the Palm Beach International Equestrian Center (PBIEC). Tomorrow’s competition will conclude an incredibly successful circuit for the third annual AGDF. LaGoy-Weltz rode Rassing’s Lonoir, her 10-year-old Danish Warmblood gelding (Lorani x De Noir), to the top of the class with a 73.421%. Second place went to Canadian Chris Von Martels and Zilverstar, who scored a 70.833%. Christopher Hickey, also of the United States, took home the third place prize for a score of 70.789% with Ronaldo. LaGoy-Weltz was pleased to see “Lono” improve from Friday’s FEI Prix St Georges class and stay with her during the test on Saturday morning. LaGoy-Weltz was also grateful for the advice offered to her by many of the world’s top dressage professionals that are in attendance at the AGDF. The supportive atmosphere has been one of the biggest benefits for LaGoy-Weltz over the last several months. “That was really great, yesterday, when I came out. Everyone was just giving me advice. Try this, put an ear bonnet on, do that. Everyone’s really supportive, which is really nice. It takes a village,” LaGoy-Weltz remarked. In the short term, continuing in that direction means qualifying for the Festival of Champions in Gladstone, NJ. LaGoy-Weltz acknowledged that Lono had matured significantly over the course of the AGDF, but he still has a lot of work to do. Collection will be the biggest focus for LaGoy-Weltz, who joked that Lono “does the hula” in his lead changes. “He likes to do everything big, so teaching him to do everything small [and collected] and be comfortable in that [is a priority]. Now he has to learn to be in the canter where is he is in the trot [mentally and physically]. Where he can put that heat into collection,” she described. Lono’s long-term plans are less well-known, but as he begins to offer high level movements on his own, LaGoy-Weltz has started to lean towards allowing him to continue advancing. “I’m definitely looking to the upper level people for advice whether to hang out and perfect small tour or go on. I think the consensus is to go on and keep going, because he’ll be better at that anyways,” LaGoy-Weltz said. “He’s offering it. I think that’s the most telling point for me. I might as well put him in a position where he’s a good boy for doing that, instead of piaffe-ing at G when I’m not supposed to be!” she concluded with a laugh. Competition for the AGDF 12 CDI 5*/3* will continue on Sunday morning at approximately 8:00 a.m. with the FEI Grand Prix Special 3*, presented by Diamante Farms. The FEI Intermediare-1 Freestyle, presented by Wellington Equestrian Realty, will follow at approximately 2:00 p.m. at The Stadium at PBIEC. For full results and more information, please visit www.globaldressagefestival.com.